Several institutions around the world have established indicators to assess prehospital emergency RT. The American National Association of EMS Officials has appointed RT mean and the arrival time to the patient in 90% of cases as indicators of EMS performance quality. The UK's National Coronary Artery Disease Network has established its EMS operational indicator as RT within 8 min in 75% of high-priority emergencies. The standard RT for the Commission on Accreditation of Ambulance Services of America is 8 min 59 s RT in 90% of cases. Taking into account, the recommendations of the American Heart Association and the National Fire Protection Association of America has also clearly defined RT standards and its components in percentile. The American Institute of Medicine recommends that any country devise its own national standard according to evidence-based operational indicators. The national standard is unique to any country and can be used to compare systems within different regions of the country. In Iran, the by-law for comprehensive coverage plan prehospital EMS was approved by the Council of Ministers in 2007. Accordingly, the Ministry of Health and Medical Education was infused with the responsibility to enhance prehospital emergency performance indicators. In the by-law, the standard established for EMS performance assessment is arrival of ambulance to the patient within 8 min in urban areas and within 15 min on roads in 80% of the cases. After nearly a decade from the establishment of the national RT standard in Iran, it seems necessary to enquire into its proper employment in the EMS assessment. A systematic review can aggregate the existing evidence in this regard, analyze the evidence, and contribute to better application of these indicators, leading finally to improved service quality. Therefore, this study aimed to investigate the way the standard RT is used in assessing EMS in Iran. This stands as the first research endeavor to critically investigate EMS performance assessment in Iran. This study aimed to systematically review articles published in English or Farsi in Iran concerning prehospital care evaluated using the RT indicator. Based on a predesigned protocol, the study examined papers published from 2007 to mid-2016 (after establishing national standard RT) using the preferred reporting items for systematic reviews and meta-analyses as a standard guideline for systematic reviews (PRISMA). In this study, EMS characterized the prehospital setting. In the current systematic review, a set of electronic databases including PubMed, Embase, Scopus, Google Scholar, and the Persian databases of Magiran and SID were searched by assistance from experienced librarians. The necessary strategies to search – which were specific to any of the databases – and Mesh and Free Text guidelines were followed. The key terms to search included Iran, (time, interval), (EMS, Emergency Medical System, prehospital, prehospital, and ambulance) as well as their combinations in English and their equivalents in Persian databases. Manual search was also performed in the reference lists of the related papers. 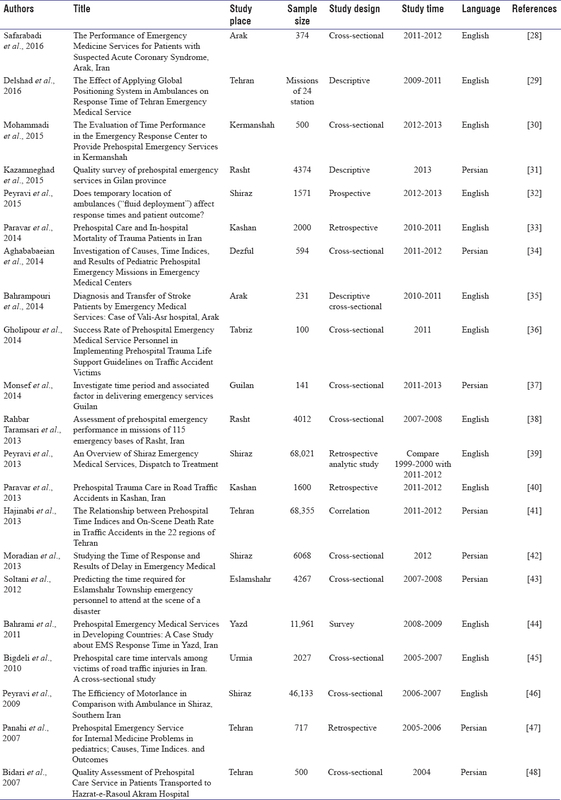 Original and full-text articles published in Persian and English journals concerning EMS RT, published from 2007 to mid-2016, were included. No limitations were imposed in terms of study type or methods. The inclusion indicator consisted of papers that used RT in prehospital emergency performance assessment. Exclusion criteria involved papers that were republished using a second language elsewhere. Unpublished papers, the ones presented in conferences, papers with imperfect statistical data, articles reporting RT from other studies, papers irrelevant to RT despite their seemingly relevant titles, and papers that examined RT from other medical fields rather than EMS were also considered as exclusion criteria. A data collection form was designed according to the purpose of the study. This provided both inclusive information about the papers including the title, the author (s), aim of the study, methods (i.e., type of study, sample size, period, and context), and publication year. The indicators used to report RT in each paper consisted of mean and percentages of RT below 8 min. The way the results were compared in terms of the indicators used (i.e., comparison of means, comparison of percentile and the national standard, or comparison of mean and the percentile standard) and the final evaluations made on EMS performance were extracted. The key terms were searched in the selected databases, yielding 110 articles. Two researchers studied independently both titles and abstracts of the papers, whereby 33 articles were found relevant to the purposes of the current study. Afterward, the full text of the articles were prepared and examined. Nonetheless, some of the papers were excluded in this stage: three papers reported RT in other medical fields, two were repetitious, three were published in both Persian and English, two used results from other studies, and finally, two were merely presented in conferences. Given the purpose of the study, which was a critical enquiry into EMS performance assessment reports, all the relevant papers were included irrespective of their quality. Two researchers completed the previous steps independently, and inconsistencies were relieved by mutual consultation. A total of 21 papers were ultimately included in the study; the characteristics of which are detailed in [Figure 1]. Having examined the databases, the researchers found 21 full-text papers eligible for the purposes of this study. They were published from 2007 to mid-2016, and none were excluded given the critical nature of this review. [Table 1] displays the details of the papers. The majority of the papers (71%) were conducted in the last 4 years (2013–2016), and 61% of them were published in English. The studies were performed in different cities with none performed on the national scale. A vast majority of the studies (90%) were cross-sectional and performed during a limited period. Only two papers compared RT changes over different time points. In the studies under focus, RT was reported in different ways. From among the 21 papers focusing on RT, seven (33%) reported RT as percentages of operations performed in <8 min. Four papers reported both mean and percentile indicators for RT concurrently. A total of 18 (86%) papers reported RT mean. RT was examined differently in the studies. The seven articles which presented RT in percentile had the opportunity to and made comparisons against the national standard. From among the papers which reported on RT mean, 14 compared their resultant means with those of other studies in Iran or those of other countries. The nine articles which reported RT based on means had made comparisons with the national standard – which uses a percentile indicator – and had made conclusions about reaching the standard time limit. All the papers had in some way judged about EMS performance with 76% approving the status quo. The results of the studies are summarized in [Table 2]. 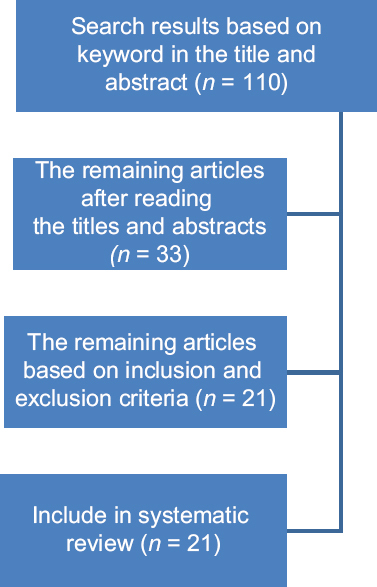 The findings indicate that the heterogeneity in reporting and assessing RT imposes a constraint on using the published data to judge achievement of standards and also leads to the following challenges in EMS performance assessment. The results of the review indicate that the approach to report the acquired RT is dissimilar in different studies. Given the status of the national standard, which is to reach the victim in <8 min in 80% of cases, it is expected that the acquired RT is reported <8 min. Under this circumstance, it would be possible to compare the results of this study with the standard and the results of other studies. To use RT as a criterion to assess and compare performance, RT must be reported in the same way in all EMS. It is because the difference in RT calculation procedure in different studies will lead to different results. RT reports are more valid in percentile and depict a more reliable picture than EMS temporal performance. It seems that failure to report RT based on the national standard is a major challenge to assessing EMS performance in Iran. Therefore, it is necessary to extract and declare RT in percentile points and according to the Iranian national standard. Results also indicated that like the limited application of the national standard to express RT, the national standard was used in a limited manner to assess EMS performance. Given the percentile description of the national standard, only one-third of the studies reported the operations made within 8 min in percentile, holding the opportunity to compare their results with the national standard. The majority of the studies used mean to assess EMS performance, impeding from comparison with the national standard. RT means reported in these studies can be compared with those of other studies conducted inside or outside Iran in dissimilar time and places. However, the circumstances are not similar, highlighting the necessity for a standard indicator in order for valid conclusions. Establishment of a national standard provides the opportunity to assess performance on regional and national scales and improve performance. 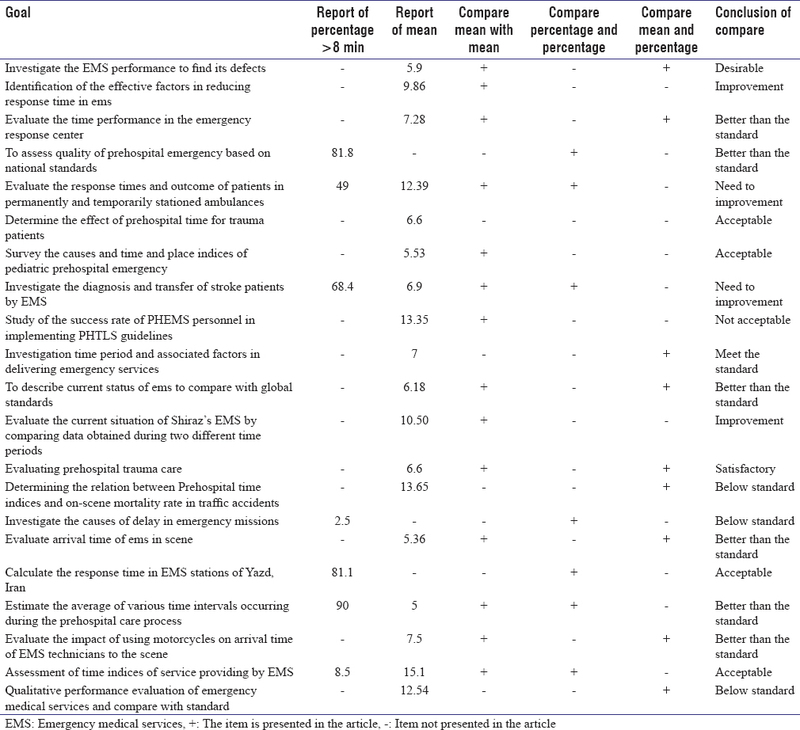 Comparison of the obtained RT and the national standard is necessary to gain confidence about whether the objectives are fulfilled or to provide feedback to the EMS system to apply proper interventions and modifications., However, the different RT assessment approaches have resulted in discrepancy in the obtained results  and have turned into a challenge as for comparability of the findings. The discrepancy observed concerned with comparisons made in some studies of the RT mean and the national standard which is in percentile. Based on this, they made conclusions about obtaining standard. Reasonably enough, RT expressed in terms of mean and percentile are not comparable, a discrepancy that leads to vagueness and invalidity of conclusions made in some of the studies., It seems that a comparison of these two unparalleled scales (i.e. mean and percentile) is a challenge to EMS performance assessment, limiting clarity of the results reported in the studies. The results report findings from cross-sectional and short-term examinations in certain areas of Iran. Only a few studies have monitored RT change over time and attainment of RT standard on the national scale. Nonetheless, it is necessary to assess EMS performance on national scale and investigate change trend in different periods to inquire into the effects of interventions performed. Other studies have emphasized lack of national statistics on time intervals. Performance assessment and service improvement require collecting and comparing the data continuously. System requirements, evidence-based guidelines for system improvement, budget determination, policy-making, and research objectives can be developed by specifying the EMS systems' performance criteria and their changing procedure. Unfortunately, there are significant differences in the reports about EMS performance in Asia which makes it difficult to compare EMS performance indicators. Thus, collaboration is needed to create a uniform information system. EMS performance assessment based on the implemented indicators and publishing the results will lead to increased accountability in EMS and also the creation of organizations which provide sufficient information for performance assessment and strategic planning. The national standard can be used to assess, monitor performance, and assess the effectiveness of instructions in EMS systems. It can also be used to answer the question “How do EMS improve patient care?”, In spite of the need for EMS development in developing countries, there are several challenges in the reports on EMS systems' performance criteria. Quality improvement and monitoring EMS systems' performance have been less emphasized in such countries. Clarity and accountability in EMS systems' performance are necessary and must be prioritized because of these challenges. In fact, clarity is the key to adequate care and is necessary to ensure that EMS accountability is fully performed. Although determining the national standard for RT is an opportunity to improve the quality of EMS, limited use of the national standard to report RT and EMS systems performance assessment may impede assessment of the status quo and the effect of quality improvement programs. Using heterogeneous data will also lead to vague judgments about the national standard. Despite the fact that pre-hospital emergency system was established in Iran in 1975, the gap is felt for a uniform and inclusive method for performance assessment to improve clarity and accountability. It is necessary to establish a uniform extraction process and compare EMS systems' performance according to the national standard at specified periods on both national and regional scales and record the results in a national integrated information system. Thus, it is suggested to use external assessment and implement accreditation for clarity and accountability of EMS. It is necessary to design profound, qualitative studies to find solutions to barriers and challenges of clarity and accountability in EMS. In addition to examining the approach to assess RT, the approach to extract RT in the Iranian context requires revision. Given the increased number of studies on EMS performance assessment in recent years, it is recommended to conduct a systematic review of prehospital emergency RT in Iran using reliable studies published in this field. In light of the purpose and critical point of view of the present study, all studies on EMS performance assessment using RT were included in the study. Examination of unpublished data and the reports available on the websites on prehospital emergency centers was not among the objectives of the study. Using only Persian and English was also another limitation of this study. This study was a part of a PhD thesis supported financially by Iran University of Medical Sciences (Grant no. IUMS/SHMIS-1393/30). Tsai D, Choi B, Sullivan F, Williams KA. Quality improvement in EMS: A unique and challenging necessity. R I Med J (2013) 2014;97:17-9. Al-Shaqsi SZ. Response time as a sole performance indicator in EMS: Pitfalls and solutions. Open Access Emerg Med 2010;2:1-6. El Sayed MJ. Measuring quality in emergency medical services: A review of clinical performance indicators. Emerg Med Int 2012;2012:161630. Fitch J. Response times: Myths, measurement & management. JEMS 2005;30:47-56. Pons PT, Markovchick VJ. Eight minutes or less: Does the ambulance response time guideline impact trauma patient outcome? J Emerg Med 2002;23:43-8. Gonzalez RP, Cummings GR, Phelan HA, Mulekar MS, Rodning CB. Does increased emergency medical services prehospital time affect patient mortality in rural motor vehicle crashes? A statewide analysis. Am J Surg 2009;197:30-4. Lim CS, Mamat R, Braunl T. Impact of ambulance dispatch policies on performance of emergency medical services. IEEE Trans Intell Transport Syst 2011;12:624-32. Carr BG, Caplan JM, Pryor JP, Branas CC. A meta-analysis of prehospital care times for trauma. Prehosp Emerg Care 2006;10:198-206. Blackwell TH, Kaufman JS. Response time effectiveness: Comparison of response time and survival in an urban emergency medical services system. Acad Emerg Med 2002;9:288-95. Bailey ED, Sweeney T, National Association of EMS Physicians. Considerations in establishing emergency medical services response time goals. Prehosp Emerg Care 2003;7:397-9. Trowbridge MJ, Gurka MJ, O'Connor RE. Urban sprawl and delayed ambulance arrival in the U.S. Am J Prev Med 2009;37:428-32. National Highway Traffic Safety Administration. Emergency Medical Services Performance Measures: Recommended Attributes and Indicators for System and Service Performance. Washington, D.C.: U.S. Department of Transportation; 2009. Available from: https://www.ems.gov/pdf/811211.pdf. [Last accessed on 2017 Dec 09]. Price L. Treating the clock and not the patient: Ambulance response times and risk. Qual Saf Health Care 2006;15:127-30. Shah MN, Bishop P, Lerner EB, Fairbanks RJ, Davis EA. Validation of using EMS dispatch codes to identify low-acuity patients. Prehosp Emerg Care 2005;9:24-31. National Fire Protection Association. NFPA 1710: Standard for the Organization and Deployment of Fire Suppression Operations, Emergency Medical Operations, and Special Operations to the Public by Career Fire Departments. National Fire Protection Association; 2010. Institute of Medicine. Emergency Medical Services: At the Crossroads. Washington: DC: Committee on the Future of Emergency Care in the US Health System; 2006. Available from: https://www.nap.edu/catalog/11629/emergency-medical-services-at-the-crossroads. [Last accessed on 2017 Dec 09]. Nasiripur A, Bahadori M, Sh T, Gohari M. Prehospital emergency performance in Iran view of comprehensive coverage plan. J Crit Care Nurs 2010;2:3-4. Available from: http://cdn.neoscriber.org/cdn/dl/355bb22a-e709-11e6-9e28-b3f18273092c. [Last accessed on 2017 Dec 09]. Haghparast-Bidgoli H, Saadat S, Bogg L, Yarmohammadian MH, Hasselberg M. Factors affecting hospital length of stay and hospital charges associated with road traffic-related injuries in Iran. BMC Health Serv Res 2013;13:281. Akbari ME, Naghavi M, Soori H. Epidemiology of deaths from injuries in the Islamic Republic of Iran. East Mediterr Health J 2006;12:382-90. Fazel MR, Fakharian E, Mahdian M, Mohammadzadeh M, Salehfard L, Ramezani M, et al. Demographic profiles of adult trauma during a 5 year period (2007-2011) in Kashan, IR Iran. Arch Trauma Res 2012;1:63-6. Bahadori M, Ravangard R. Determining and prioritizing the organizational determinants of Emergency Medical Services (EMS) in Iran. Iran Red Crescent Med J 2013;15:307-11. Khorasani-Zavareh D, Mohammadi R, Khankeh HR, Laflamme L, Bikmoradi A, Haglund BJ, et al. The requirements and challenges in preventing of road traffic injury in Iran. A qualitative study. BMC Public Health 2009;9:486. Mahdian M. Establishing an integrated trauma system in Iran: The time of translating information into action. Arch Trauma Res 2015;4:e28117. Modaghegh MH, Roudsari BS, Sajadehchi A. Prehospital trauma care in Tehran: Potential areas for improvement. Prehosp Emerg Care 2002;6:218-23. MacFarlane C, Benn CA. Evaluation of emergency medical services systems: A classification to assist in determination of indicators. Emerg Med J 2003;20:188-91. Safarabadi M, Pakniyat A, Darvishi A, Harorani M. The performance of emergency medicine services for patients with suspected acute coronary syndrome, Arak, Iran. J Iran Clin Res 2016;2:153-7. Available from: https://jicr.arakmu.ac.ir/article-1-72-en.pdf. [Last accessed on 2017 Dec 09]. Delshad V, Shemshadi H, Moradian MJ, Ahmadi S, Malkyan L, Sabzalizadeh S. The effect of applying global positioning system in ambulances on response time of Tehran emergency medical service. Health Emerg Disasters Q 2016;1:125-8. Mohammadi M, Nasiripour AA, Fakhri M, Bakhtiari A, Azari S, Akbarzadeh A, et al. The evaluation of time performance in the emergency response center to provide pre-hospital emergency services in Kermanshah. Glob J Health Sci 2015;7:274-9. Kazamneghad E, Pourshaikhian M, Vatankhah S. Quality survey of pre-hospital emergency services in Guilan province. J Guilan Univ Med Sci 2015;23:50-8. Available from: http://journal.gums.ac.ir/article-1-920-en.pdf. [Last accessed on 2017 Dec 09]. Peyravi M, Khodakarim S, Örtenwall P, Khorram-Manesh A. Does temporary location of ambulances (“fluid deployment”) affect response times and patient outcome? Int J Emerg Med 2015;8:37. Paravar M, Hosseinpour M, Mohammadzadeh M, Mirzadeh AS. Prehospital care and in-hospital mortality of trauma patients in Iran. Prehosp Disaster Med 2014;29:473-7. Aghababaeian H, Jamalpor M, Mosavi A, Ghanavati S, Rasoli S, Haji-araghi N. Investigation of causes, time indices, and results of pediatric pre-hospital emergency missions in emergency medical centers affiliated to Dezful university of medical sciences, 2011-2012. Sadra Med Sci J 2014;2:289-298. Available from: http://www.sid.ir/FileServer/JF/3004413930307. [Last accessed on 2017 Dec 09]. Bahrampouri S, Khankeh HR, Dalvandi A. Diagnosis and transfer of stroke patients by emergency medical services: Case of Vali-Asr hospital, Arak. Health Emerg Disasters Q 2014;1:152-60. Available from: http://www.sid.ir/En/Journal/ViewPaper.aspx?ID=519751. [Last accessed on 2017 Dec 09]. Gholipour C, Vahdati SS, Notash M, Miri SH, Ghafouri RR. Success rate of pre-hospital emergency medical service personnel in implementing pre hospital trauma life support guidelines on traffic accident victims. Turk J Emerg Med 2014;14:71-4. Monsef V, Asadi P, Maleki Ziabari S. Investigating time period and associated factors in delivering emergency services Guilan (1390-1392). J Guilan Univ Med Sci 2014;24:1-6. Available from: http://journal.gums.ac.ir/article-1-1034-fa.pdf. [Last accessed on 2017 Dec 09]. Rahbar Taramsari M, Badsar A, Naghipour M, Dvam F, Shahrami H, Saeidinia A, et al. Assessment of pre-hospital emergency performance in missions of 115 emergency bases of Rasht, Iran. Ann Biol Res 2013;4:75-81. Available from: http://www.scholarsresearchlibrary.com/abstract/assessment-of-prehospital-emergency-performance-in-missions-of-115rnemergency-bases-of-rasht-iran-11460.html. [Last accessed on 2017 Dec 09]. Peyravi M, Ortenwal P, Djalali A, Khorram-Manesh A. An overview of shiraz emergency medical services, dispatch to treatment. Iran Red Crescent Med J 2013;15:823-8. Paravar M, Hosseinpour M, Salehi S, Mohammadzadeh M, Shojaee A, Akbari H, et al. Pre-hospital trauma care in road traffic accidents in Kashan, Iran. Arch Trauma Res 2013;1:166-71. Hajinabi K, Riahi L, Gholipur Varaki H. The relationship between prehospital time indices and on-scene death rate in traffi c accidents in the 22 regions of Tehran. Health Inf Manage 2013;11:353-61. Available from: http://www.ensani.ir/storage/Files/20160612140141-9567-295.pdf. [Last accessed on 2017 Dec 09]. Moradian M, Peyravi M, Ettehadi R, Pourmohammadi K. Studying the time of response and results of delay in emergency medical system. J Rescue Relief 2013;5:30-9. Available from: http://jorar.ir/article-1-152-fa.pdf. [Last accessed on 2017 Dec 09]. Soltani M, Asadi Manesh L, Rajabi Z. Predicting the time required for Eslamshahr township emergency personnel to attend at the scene of a disaster. J Rescue Relief 2012;4:67-78. Available from: http://jorar.ir/article-1-131-fa.pdf. [Last accessed on 2017 Dec 09]. Bahrami MA, Maleki A, Ranjbar Ezzatabadi M, Askari R, Ahmadi Tehrani GH. Pre-hospital emergency medical services in developing countries: A Case study about EMS response time in Yazd, Iran. Iran Red Crescent Med J 2011;13:735-8. Bigdeli M, Khorasani-Zavareh D, Mohammadi R. Pre-hospital care time intervals among victims of road traffic injuries in Iran. A cross-sectional study. BMC Public Health 2010;10:406. Peyravi MR, Tubaei F, Pourmohammadi K. The efficiency of motorlance in comparison with ambulance in Shiraz, Southern Iran. Iran Red Crescent Med J 2009;11:330-3. Available from: http://www.sid.ir/FileServer/JE/88120090315. [Last accessed on 2017 Dec 09]. Panahi F, Mohebbi HA, Farahani MA, Vishteh HR, Assari S. Prehospital emergency service for internal medicine problems in pediatrics; Causes, time indices and outcomes. Iran J Pediatr 2007;17:179-85. Available from: http://ijp.tums.ac.ir/index.php/ijp/article/download/720/719. [Last accessed on 2017 Dec 09]. Bidari A, Abbasi S, Farsi D, Saeedi H, Mofidi M, Radmehr M, et al. Quality assessment of prehospital care service in patients transported to Hazrat-e- Rasoul Akram Hospital. Med J Tabriz Univ Med Sci 2007;29:43-6. Available from:http://www.sid.ir/FileServer/JF/58613860307. [Last accessed on 2017 Dec 09]. Pons PT, Haukoos JS, Bludworth W, Cribley T, Pons KA, Markovchick VJ, et al. Paramedic response time: Does it affect patient survival? Acad Emerg Med 2005;12:594-600. Sohn H, Reyes G, Escobar C. Optimizing the Performance of the Dona Ana County Ambulance Service. 2014. Roudsari BS, Nathens AB, Arreola-Risa C, Cameron P, Civil I, Grigoriou G, et al. Emergency Medical Service (EMS) systems in developed and developing countries. Injury 2007;38:1001-13. Graham DH. Motivation for documentation. Emerg Med Serv 2004;33:39-40. Dawson DE. National emergency medical services information system (NEMSIS). Prehosp Emerg Care 2006;10:314-6. Rahman NH, Tanaka H, Shin SD, Ng YY, Piyasuwankul T, Lin CH, et al. Emergency medical services key performance measurement in Asian cities. Int J Emerg Med 2015;8:12. O'Hagan J, Persaud D. Creating a culture of accountability in health care. Health Care Manag (Frederick) 2009;28:124-33. Gunderson M. Principles of EMS system design. Emergency Medical Services: Clinical Practice and Systems Oversight. 2nd ed. John Wiley & Sons, Ltd; 2015. p. 1-16. Fahimi Y. EMS and its role in disaster medicine. Resuscitation and Life Support in Disasters, Relief of Pain and Suffering in Disaster Situations. Springer, Berlin, Heidelberg. 1980. p. 265-7. Available from: https://link.springer.com/chapter/10.1007/978-3-642-67095-4_70. [Last accessed 2017 Dec 09].